Code it Pretty: Practical HTML for Bloggers Starts Soon! 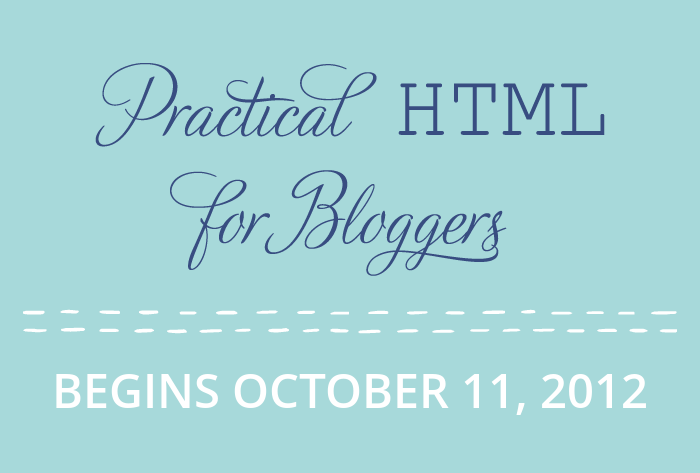 Practical HTML for Bloggers Starts Soon! Remember that secret project I dropped hints about back in May? I'm finally ready to announce it! So what do I mean by "Practical HTML"? I've found that I learn new things faster when I can apply that new knowledge to something practical, right away. Most HTML tutorials for beginners start you out at the very beginning, with nothing but a blank page. But, a blogger doesn't work on a blank page; most of the structure of your blog is already there thanks to your blogging platform/CMS. You may be wondering why, exactly, I'm teaching you to use HTML in your blog posts. Aren't you getting along just fine with your rich text editor? Here are three reasons why the HTML knowledge you gain from this series will improve the quality of your blog. HTML is very similar to punctuation, in that it provides a structure for your writing that makes it easier for your readers to understand. Honestly, I'd argue that HTML is easier to learn — and way less quirky— than actual punctuation! On the web, your readers are both human and non-human. When you take advantage of the elements of HTML to format your post, it's easier for your human readers to read, skim, and digest the information in it. And, you also make it easier for search engines to understand the structure of your post and determine how relevant your post is to keyword searches. Using HTML elements in your blog posts will give you much more control over how your posts look, both on your blog and when the posts are consumed in other formats such as RSS feeds, "read later" services like Instapaper, or with your readers' own custom stylesheets. That control extends to the style of your posts, too. When you use HTML elements in your posts, you gain the option to style your posts with CSS. If you've ever noticed blogs with cool pull quotes or custom fonts in the body of a post, they're using CSS, enabled by the use of HTML elements. HTML elements like headings, paragraphs, and lists improve the accessibility of your blog for visitors with disabilities by simplifying navigation within the post and enabling skimming with screen readers and other assistive technologies. Don't think you have any people with disabilities in your audience? That's a common misconception, especially among bloggers with highly visual content. I recommend you check out this post from web accessibility expert Katie Cunningham: So, You Don't Have Any Disabled Users? I'll expand on these three reasons throughout the series, and give you even more reasons to love HTML as we progress. I can't wait to get started! Ready to get started? I've got one super-quick assignment for you this week so you'll be ready to jump right in next Thursday. Your Assignment: Find out how to write and edit HTML posts on your blogging platform. Hint: for most platforms, you can switch over to HTML view with one click. Title cards for this series designed by the absolutely wonderful Jenna from Little Bit Heart. She is the best.